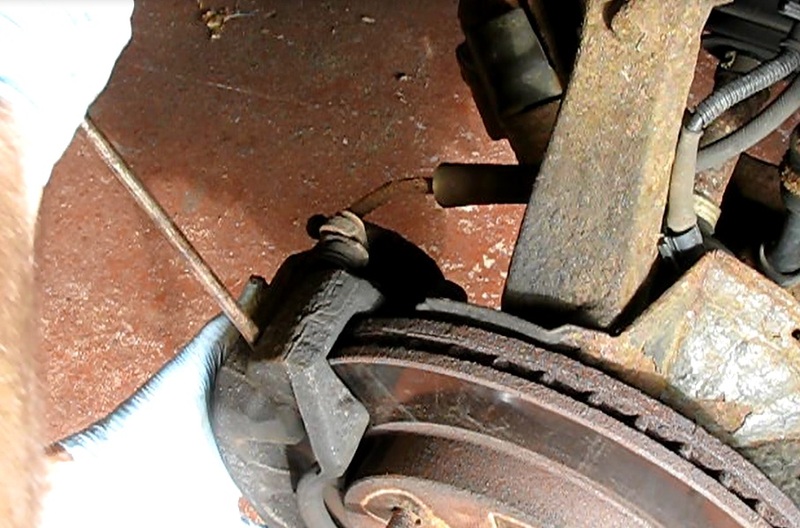 Pulsing upon braking signaled that the front brakes were in need of attention on my 2000 Ford F150. This post will cover checking the pads and rotors for wear and checking the caliper pins for smooth operation. Look for attention to detail and bonus information in this post to help you perform a great brake job on your related vehicle, such as a Ford F250, Expedition or Lincoln Navigator. Tools: 13 and 18mm sockets, large straight blade screwdriver or pry bar, micrometer (optional), ruler, Large C-clamp and washer, may need grinding tools. Cost of parts: ceramic pads: $35.49 (Napa TS-7558-X) Rotors turned for $12ea. 1) Break the lug nuts on the front wheels. Put on the parking brake and block a rear tire. 2) Jack up the front of the truck and place on jack stands. I used a floor jack under the front cross member. 3) Remove the lug nuts and wheels. 4) Clean the rotors and calipers with brake parts cleaner. Wear a face mask during and even after cleaning for protection from toxic brake dust. 4) Measure the thickness of the brake pads through the inspection window in the caliper. The wear limit is 1/8". The inboard pad on this vehicle was right at 1/8". I will replace them. 5) With a 13mm socket and breaker bar break the 13mm caliper bolts and remove them. 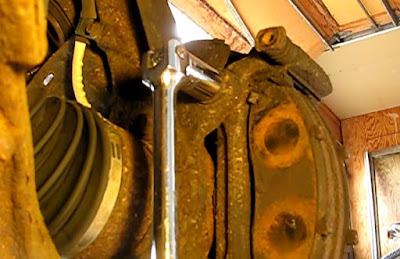 6) With a large screwdriver or pry bar, pry the caliper away from the rotor at the top and bottom of the caliper. Set the caliper on the steering knuckle or better yet, hang it with some wire from a secure point above. 7) Remove the two 18mm pad-holder mounting bolts with a socket and breaker bar. 8) Remove the pad-holder and pads. Look the pads over closely for signs of irregular wear. The inboard pads on mine were much more worn than the outboard. The inboard pads also had more wear on one end than the other. This made me even more doubtful that the rotors could simply be re-used. 9) Remove the rotors. If they are rusted on use some penitrant and tap them with a rubber hammer as you turn the hub to jar them loose. 10) Inspect the rotors for thickness. I used a micrometer gauge to check the thickness just under the raised lip on the outside edge. The measurement was 1.15". The wear limit on this rotor is 1.12". These rotors had plenty of material left on them and were prospects for turning at a machine shop. I took them in and a couple of days later had like new rotors for just $25 total. New rotors were cost around $32 each so that was worth the trouble to take in and have resurfaced. 11) Remove the old pads from the holders. Make note of the rattle clip on the inboard pad to make sure the pad with the clip in the same place is installed there. They are also different from side to side. It may be necessary to use a hammer and chisel to dislodge them. Do one caliper at a time to have one for a re-assembly reference if needed. 1) Replace the caliper hardware, if needed. If not replacing, clean the mating surfaces with the pads with steel wool or other abrasive. Next put some caliper grease on the mating surfaces of both the caliper hardware and the new pads. 2) Position the new inboard brake pad. This is a good time to make sure the new pad will slip in nicely alongside the rotor. Back it off till it is about 3mm from the end of the hardware clip, This will make for easier assembly later. 3) Place the outboard pad in the caliper, although this can also be done after the shoe holder is mounted. It fits looser in the caliper and may fall out now. 4) This is a good time to lubricate the backing plates on the pads to prevent squeal. Use the caliper grease again and use the old pads as guides to find the circular contact surfaces where the grease is needed. 5) Check and re-lube the caliper pins. They should move freely in the caliper. Even if they do, it's a good practice to pull them out, remove the old grease and re-lube with fresh caliper grease. 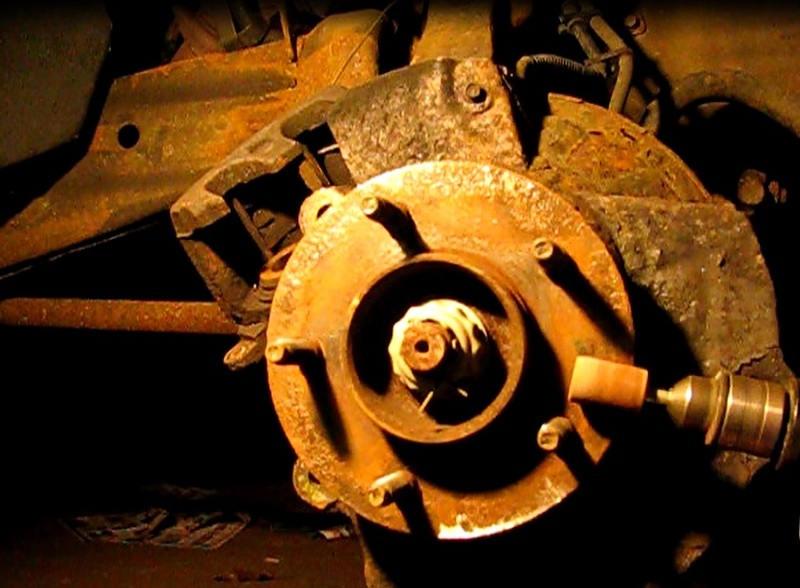 Often the hub will have some surface rust on it that should be removed. If not cleaned up and ground flush, the rotor may miss-align with the caliper, causing reduced braking effectiveness and uneven, premature wear of the new pads. 1) Remove the rust with a wire brush or sandpaper. Often a rotary tool such as a power drill will help. If the rust is excessive, a grinding stone may need to be fitted onto the drill. Use a straight edge to confirm that the surface is flat. Finish with some steel wool and then clean with a solvent like lacquer thinner. 2) Apply anti-seize compound to the rotor and hub mating surfaces. This will aid in removal of the rotor in the future. 1) Mount the pad holder bracket with the inboard pad installed. Turn in the 18mm pad holder bracket bolts by hand as far as possible. Finish up with a ratchet and then torque to 136 ft lbs..
2) Install the outboard brake pad in the holder. 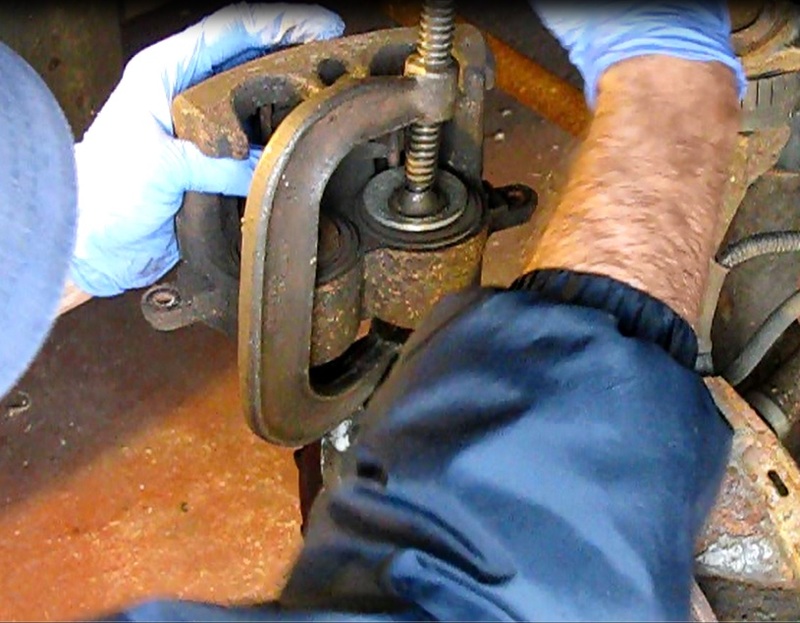 3) Retract the pistons into the caliper. The pistons will undoubtedly be too far out now to be able to fit over the much thicker new pads. 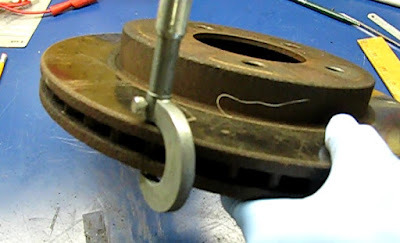 Use a large C-clamp and washer to alternately push each piston further back into the bore. This may take a few tries, as retracting one piston will cause the other to move out a bit. 4) Put a little caliper grease on the contact surfaces of the pistons. 5) Install the caliper. Start the 13mm mounting bolts by hand and then a ratchet, finishing with a torque wrench set at 21-26 ft lbs. 1) Test. With the truck off the ground, this is good time to test the braking action. Have a helper hit the brake pedal while you try to turn the rotor with a square shaft screwdriver or pry bar leveraged between two lug nuts. Make sure the caliper holds the rotor fast with the pedal down and also that it releases immediately upon end of braking. 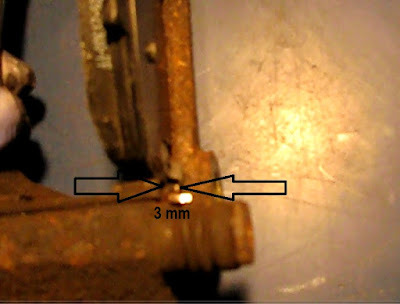 2) Apply some anti-seize compound to the contact surfaces of the rotor and wheel to prevent future seizing of the two. 2) Remount the wheels and alternately turn in the lug nuts till they seat. 3) Lower the truck to the ground. 4) Alternately and in stages torque the lug nuts to 100 ftlbs (12mm studs) or 150 ftlbs (14mm studs). 5) Test drive the truck. Tired of spending a small fortune for automotive repair? There are many jobs you can do yourself. One of those is a disc brake job. The job isn't that hard and you will save a decent sum of money by doing it yourself. 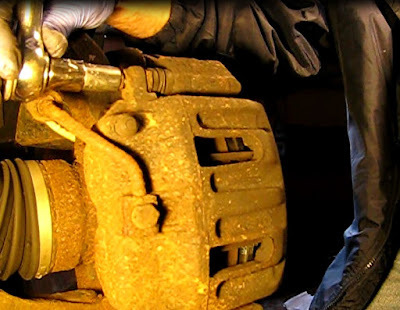 Mechanical failures (like bad brakes) are a factor in an estimated 12% to 13% of all auto accidents. Many of those are due to bad brakes because of a lack of proper vehicle maintenance, something that could have been prevented.